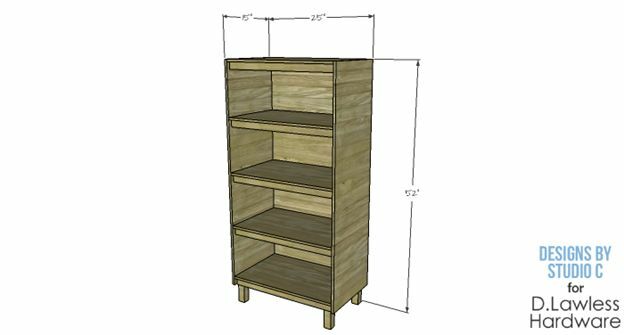 This easy to build bookcase uses 2’ x 4’ sheets of medium density fiberboard (MDF), an inexpensive alternative to plywood, and has fabulous, sleek metal legs. The back of the bookcase in the example was covered with a coordinating wallpaper for a pop of color! Cut the pieces for the sides, and the front and back stretchers. 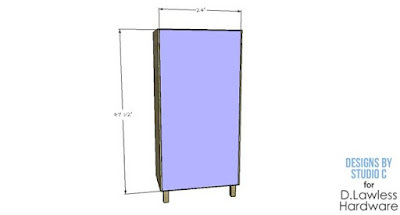 Secure the stretchers using glue and 1-1/2” brad nails as shown in the drawing, locating them ½” back from the front and back edges of the sides. 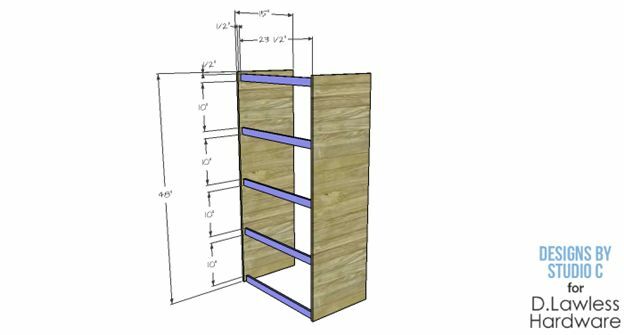 The top stretchers will also be located ½” down from the top of the sides. 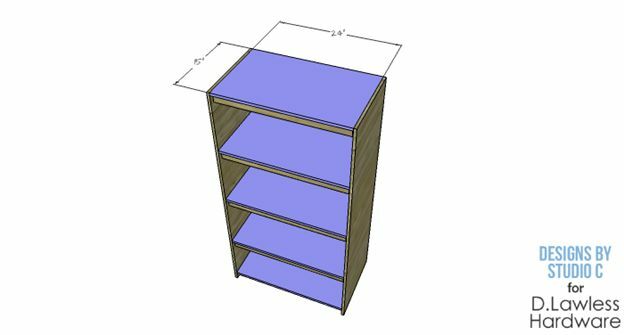 Cut the pieces for the shelves, top and bottom. Position these pieces on top of the stretchers securing in place with glue and 1-1/2” brad nails. Cut the piece for the back. 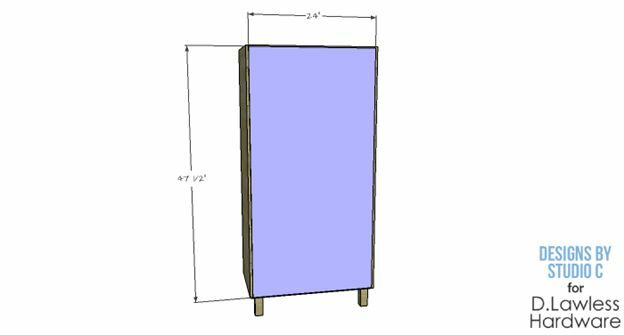 If using wallpaper to cover the inside of the back, apply a coat of glue or Mod Podge to one side of the back piece, then smooth the wallpaper in place. Trim away any excess. 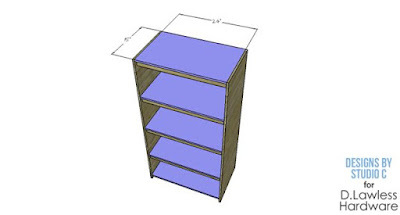 Secure the back in place using glue and 1-1/2” brad nails through the back into the sides, shelves, top and bottom. Finish as desired. 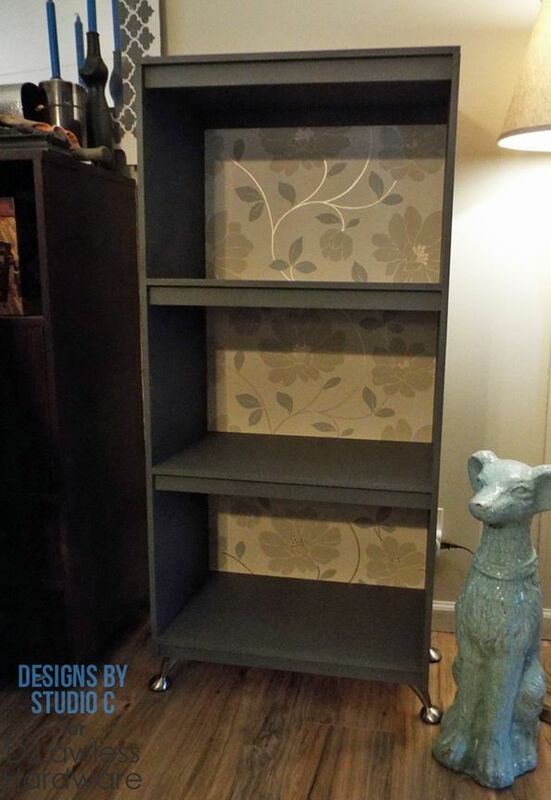 I used a few coats of a charcoal grey chalk paint on the example, then used a clear wax over the paint. 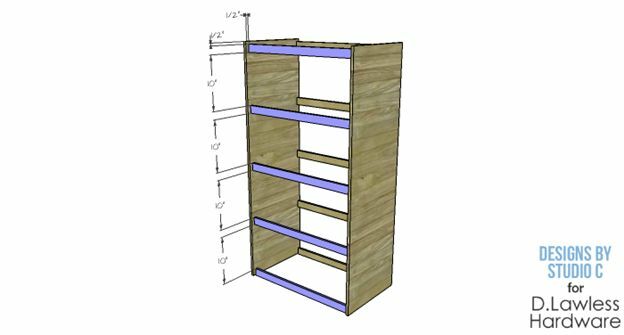 Secure a 2x4 block in each corner of the bottom under the lower shelf using glue and 1-1/2” brad nails through the top of the shelf. Position the legs on the blocks, then secure the legs using 1” screws. Find us at Summer Camp! 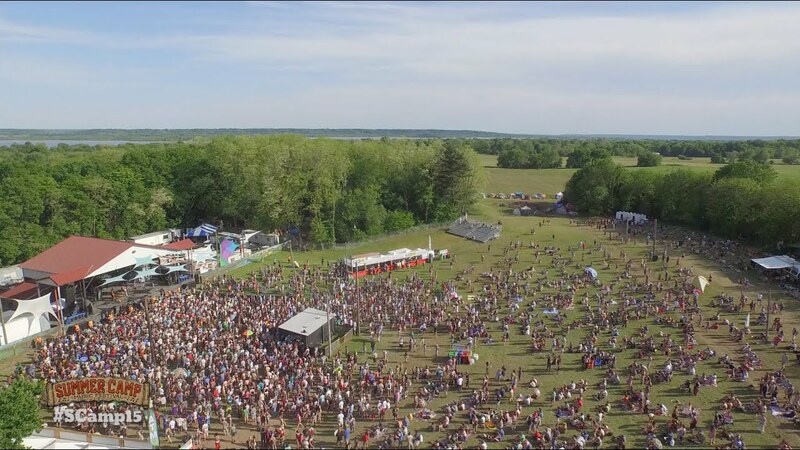 The Lawless Bros. social media team will be at Summer Camp Music Festival this weekend. If you can find us we'll give you a gift card. Good luck! We'll be one of these people and will be wearing tiny top hats. 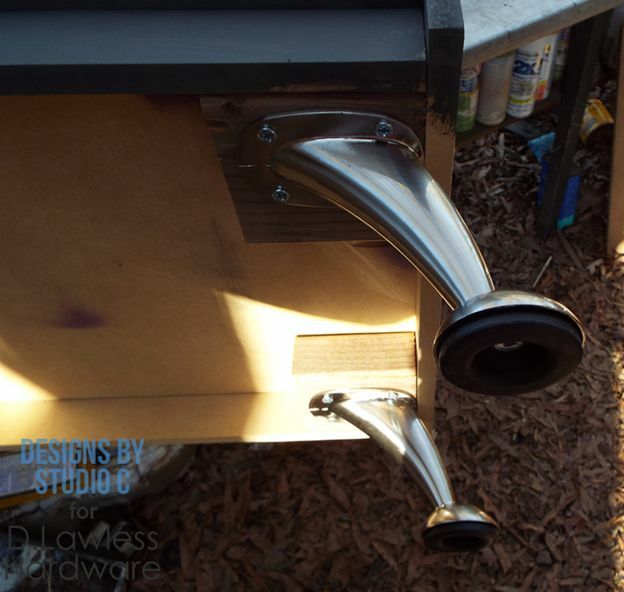 General Finishes & D. Lawless Hardware - Furniture Makeover Perfect Storm! Over the past several years for marketing online I've had the pleasure of being introduced to a lot of great products that are also used in our kitchen and furniture niche. One of those companies is General Finishes who I kept seeing our partners using on the same projects that our hardware was being used on. 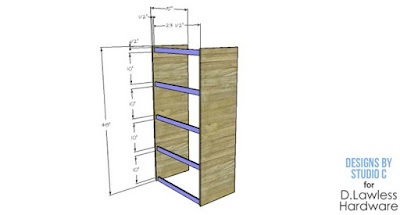 Over the past year or so I've gotten to know some of the team at General Finishes and we'll be having a booth at the General Finishes Flippin Furniture Expo in Chicago this year. When gathering some promotional material to share in the lead up to the event it struck me that there had to be a ton of furniture flips featuring both products. So I multi tasked this blog post while gathering information and photos for them to promote us as a partner at the show. As usual, I'm sure I missed many posts, so if you want yours included just let me know and I'll add it. These posts all feature a piece of junk turned beautiful by a talented blogger using General Finishes paint and D. Lawless Hardware. Click through to see the full before and afters! The first post comes from 38th Street and shows off a beautiful wide Jefferson dresser with antique copper hardware and Queenstown Gray milk paint. 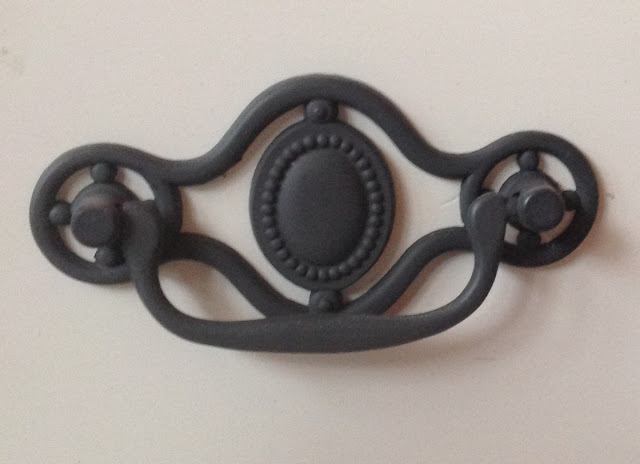 This next post features one of our most popular pieces of hardware the antique pewter fleur de lis knob we have at a great price. 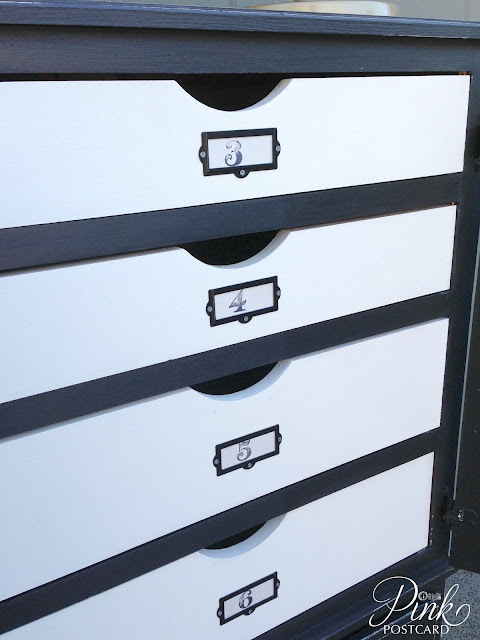 Sheila of Plum Doodles used Snow White milk paint from General Finishes. Next up is this rustic dresser from Cassie at Primitive & Proper using sun aged antique style glass pulls from us and White Winter Glaze from General Finishes. The next post is from the first ever D. Lawless All-Star! Stacey at Embracing Change used General Finishes Persian Blue paint alongside our very affordable acrylic pumpkin style knobs on a nice little hall table. This post is just like a who's who of my longest running blog partners! Next up is one of the first people I ever had the pleasure of working with, Angela from Number Fifty-Three. 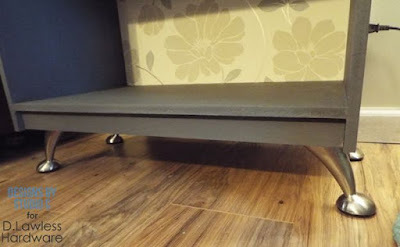 Angela uses our milk black glass knobs alongside General Finishes Patina Green on this hall dresser. 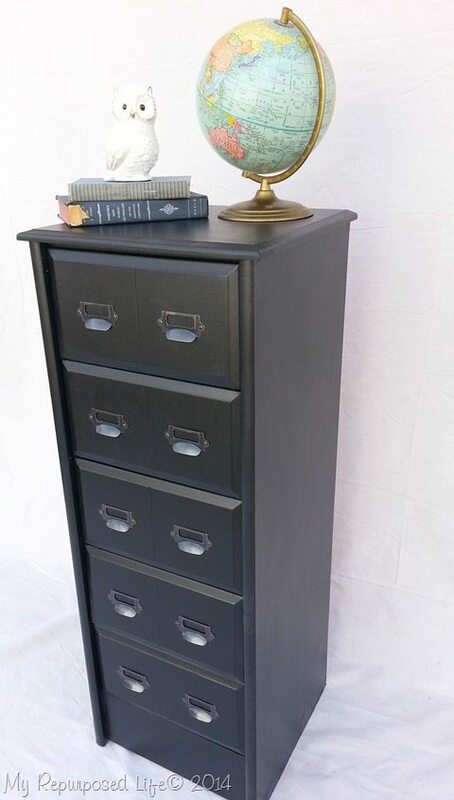 Next up is a nice repurposed tall black dresser from My Repurposed Life. Gail used our super popular label holders and Lamp Black paint from General Finishes. Another frequent poster for us is Jenny from Evolution of Style. Normally she's doing kitchens, but she did a great job on these small end tables using our cut glass knobs and General Finishes Driftwood. 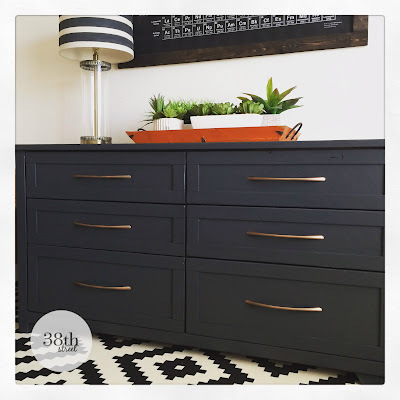 This next dresser is a true beauty with all the gold trim! 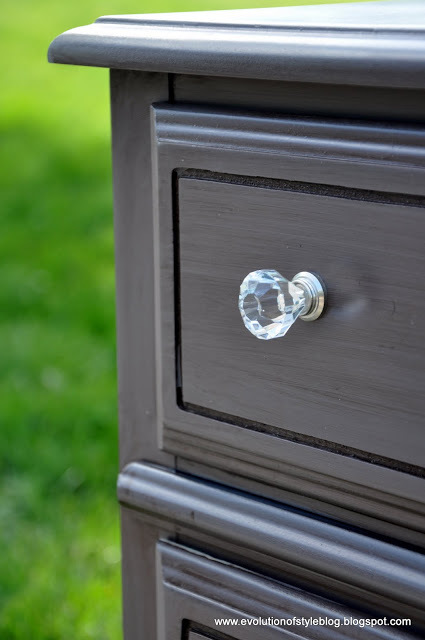 Jenny from Refresh Living used our milk white glass knobs with Coastal Blue from General Finishes really turn an old scuffed up piece into something that would look great anywhere. This next project from Highstyle Restyle uses our label holders and Driftwood from General Finishes to turn a worn out little dresser into a lovely little apothecary cart. 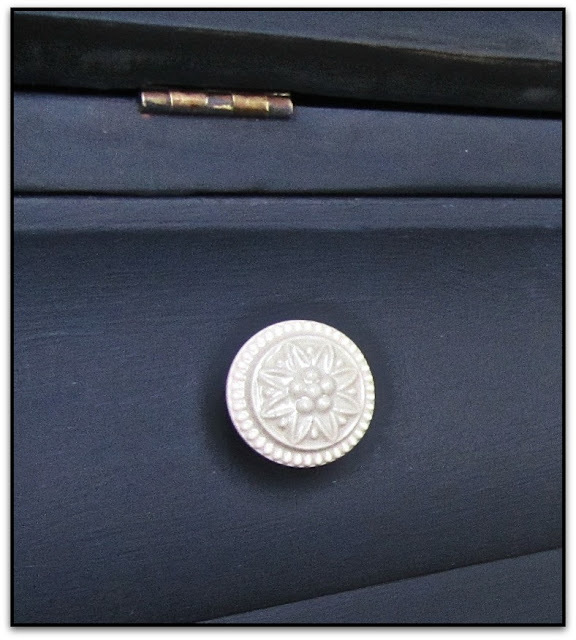 This closeup of Midnight Blue paint and our ornate ceramic knobs is from a nice empire desk makeover at Patina Paradise! I love the staging and the colors everytime I see this shot of our green cut glass knobs from Art is Beauty. 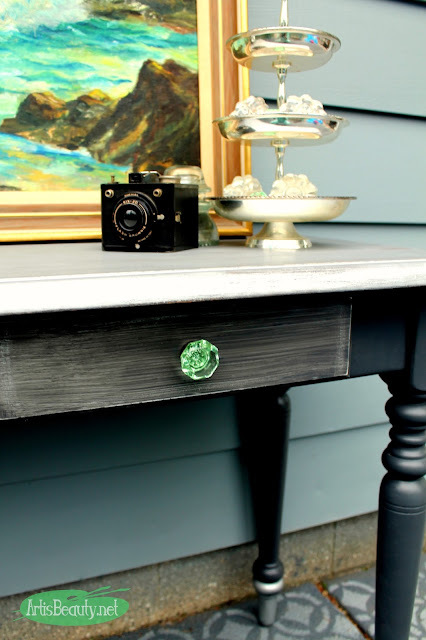 Our glass knobs pair perfectly with Java Gel and Gray General Finishes paint on this hall table makeover. And last but not least is this cabinet makeover from Noble Vintage featuring our label holders and Sage Green paint from General Finishes! We deal a lot in closeouts from businesses that unfortunately didn't make it or from people that just plain want rid of a lot of hardware. A couple years back we picked up a huge load of Hillman Hardware that was in TOTAL disarray. Well, with everything going on we sat on it and sorted it on and off for the last couple years, but we just now got it ready for sale. So if your are looking for high quality screws, anchors, bolts, picture frame hangers, nuts, etc. then we have THE BEST prices on these items from Hillman Hardware, a quality name in hardware for years and years. We just got started with about 70 items, all card packed and brand new. Over the next few months we'll be listing hundreds and hundreds of this utility hardware which will be good for us and our customers as we have had a sparse selection of this type of stuff in the past and our prices will of course embarrass the competition! THIS PROMOTION HAS ENDED. PLEASE CHECK BACK EACH FRIDAY! This will be the last Free Hardware Friday for at least two weeks but it may be longer than that before we host another one. It will be back for sure but I'm out of town this next week at the Summer Camp Music Festival and I may be traveling the next weekend as well. 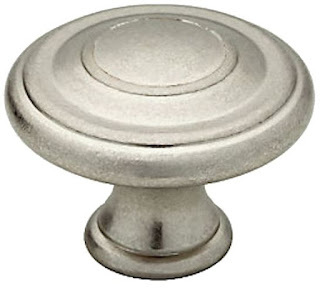 But to make it up I've got a beautiful Vintage Nickel Knob from Liberty Hardware. Sometimes I'm giving away cheap generic stuff but this is a real beauty and is currently selling for $3 a pop at our competitors stores. Over the years we've had the opportunity to work with many very talented people and there are a few that have done a LOT of projects with our hardware. One of these people is Stacey from Embracing Change. The other day she wrote to me with yet another project and post which she used our glass knobs on. It got me thinking...how many posts have you done for us? Did I even give you hardware for half of these posts? Don't I need something to write about on our blog? LOL! So this is the first edition of D. Lawless All Stars! There are several others out there but Stacey is the perfect place to start. Below I'm just gonna shoot through a nice group of projects using our hardware she's done over the years as a big thank you to her. She always gives us very high quality photography (the most important thing of course) on beautiful projects. You can click each image to see the full furniture makeover, some of the before and afters are quite impressive! I had to click "next page" in her site search three times to find the first post she did with our hardware back on January 1st of 2014 on a rustic Amish style cabinet with our mint green glass knobs. From then on the floodgates were open! As I said, floodgates open. Stacey used the hardware I sent her to post for us again three times in the next week! No rest for the weary! After a short break Stacey went on another streak with our hardware through February! We have these glass knob photos all over our site and I wish I could find more spots to use them! I love the staging, always great staging! When going through her furniture makeover posts it's almost as if you can tell what season it is by her paint choices. After emerging from a cold February of blacks and greys Stacey brought us some nice bright makeover projects as the spring came on. Talk about being highly productive! We are only to May and she's already completed 10 projects with our hardware and this is only a fraction of the projects she posted overall during this time! The last project was completed just a few days ago and is just as lovely as the rest. It's been a pleasure working with Embracing Change and we look forward to working together far into the future. Thirty three posts all together and I don't even think I provided hardware for a good portion of them!